A bridge or partial dentures may also be considered. 3M(TM) MDI mini dental implants are a minimally invasive treatment that can immediately stabilize loose dentures, eliminating the need for messy denture adhesives. Why MDI Mini Dental Implants? Even the best denture adhesives can't compare to the denture stability achieved with mini dental implants. 3Mâ„¢ MDI mini dental implants are designed to help denture wearers laugh, talk and live with comfort and confidence. 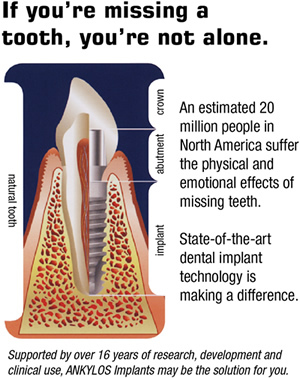 The mini dental implant procedure takes place in your dentist's office, with local anesthesia. Typically, the procedure takes only one appointment and can be completed within 2-hours! Implants are designed to help your dentures work like natural teeth, allowing easy and comfortable mobility for functions such as eating, talking and laughing. Because of the minimally invasive nature of the mini dental implant procedure, the MDI placement won't require you to go through a lengthy healing period. Within a few days, you'll be out and about, enjoying a lunch of your favorite foods, talking with ease, laughing and smiling freely. All that time, you're feeling a new stability in your denturesâ€”secure that they have the staying power you need without messy denture adhesives or creams.